Films labelled critical turkeys are widely popular, as Benjamin Moore has pointed out. Ever watched a film, loved it, and just could not understand why critics thought it was awful? You're not alone. 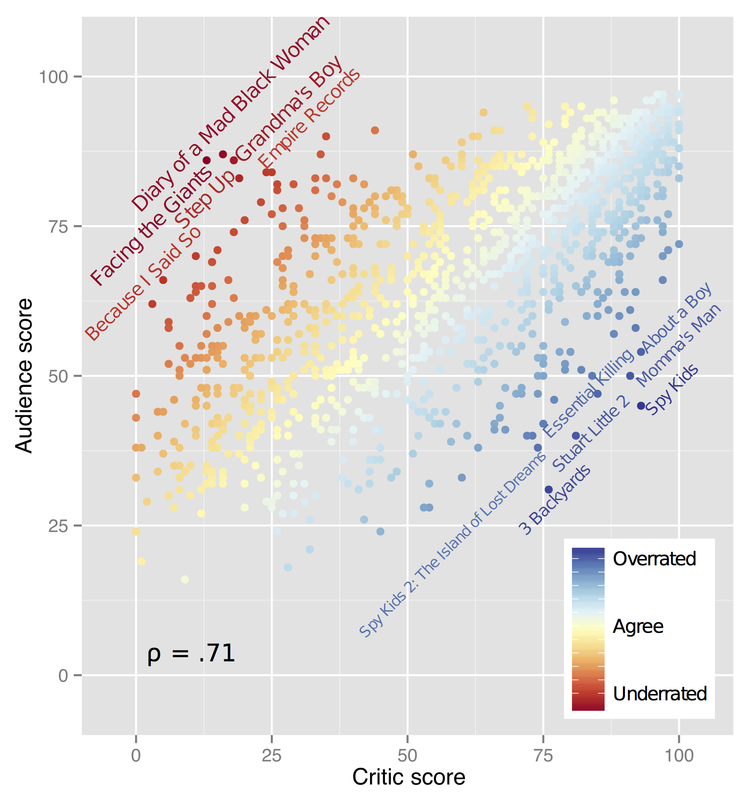 Benjamin Moore, a PhD candidate in bioinformatics at the University of Edinburgh used data from reviews aggregator Rotten Tomatoes – via its public API – to show that the cinema-going public is often at odds with critical opinion. It seems that a bad review has little or no effect on people's enjoyment of a film, while film fans are not always persuaded by a film's glowing reviews either. While critics and film fans agree "most of the time", he says, many films are wildly underrated or overrated by professional critics, compared to ordinary people's user reviews on Rotten Tomatoes. The films in blue at the bottom right were considered overrated while the films in red at the top left were thought to have been underrated by critics. 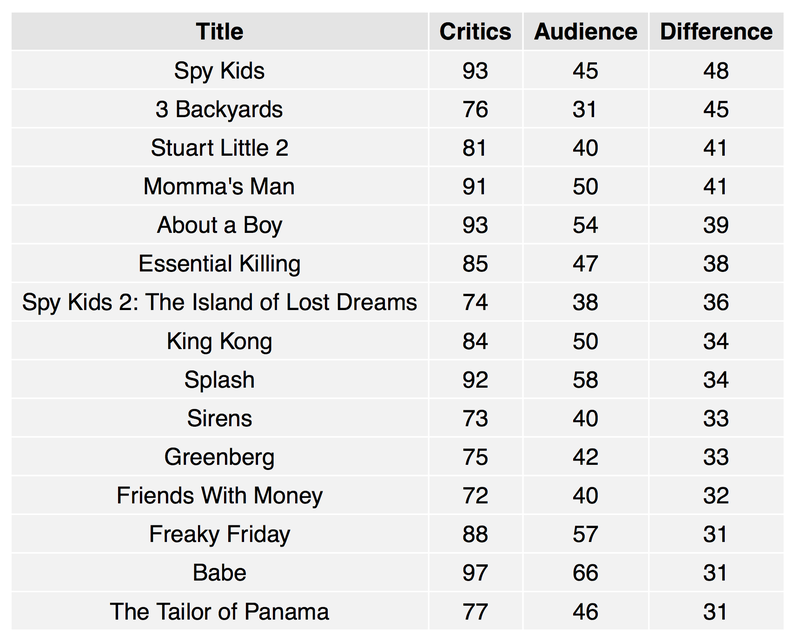 These are the films with the lowest critic score but the highest fan rating. So dance film Step Up from 2006, which received one-star ratings from a host of critics, gets an aggregate 86% score from viewers. 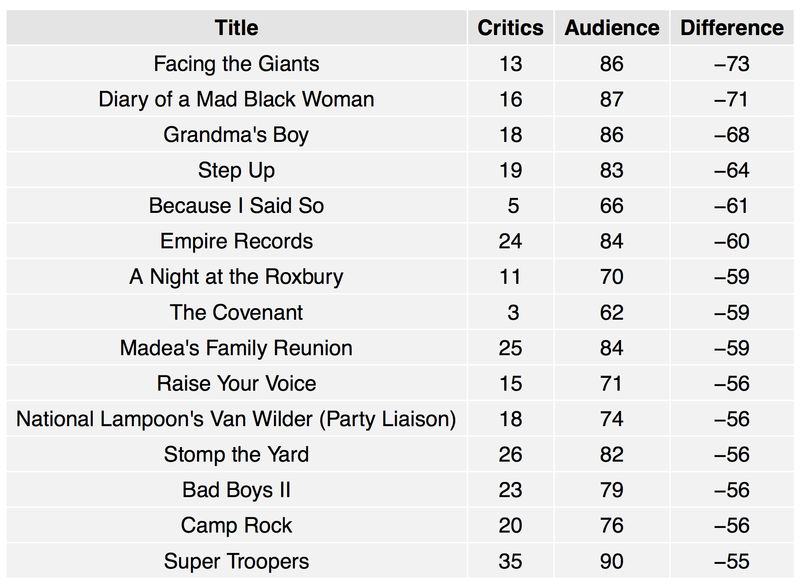 Top of the list is Facing the Giants, a 2006 Christian-themed sports film, which got an aggregate score of 13% from critics but 83% from fans and made $10 million at the US box office. Meanwhile, the most overrated films. Legendary film critic Robert Ebert said Spy Kids was "an intelligent, upbeat, happy movie" on its release in 2001, giving it 4.5 stars out of 5. But viewers disagree, giving it an aggregate score of just 45% on Rotten Tomatoes. Nevertheless, the film went on to make $112 million at the US Box Office alone, prompting a swift sequel. Plus, a critic's review comes out as the film does, whereas fans' reviews keeping on coming – these discrepancies might be a sign that people's opinion of films simply changes over time.